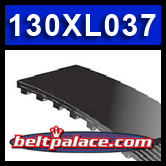 130XL037 TIMING BELT: 65 Teeth, 13" Pitch Length: Bando 130xl037 Timing Belts: 3/8" Wide - 1/5" (.200/XL) Pitch. Replaces Milwaukee (Obsolete) 42-25-2500 - TIMING BELT. 130XL050 HTD Timing Belt. 13.0” Length, 65 teeth, 1/2” Wide. Neoprene HTD 130XL-050 Timing belt 130XL-050. Industrial Grade.